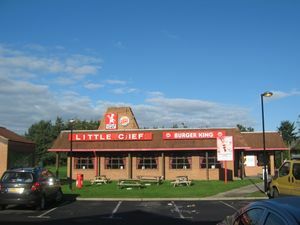 A former Little Chef site at the end on the A19, where it meets the A1. This service area was built by Kelly's Kitchen and Petrofina, and became a Little ChefHistory site. As with all the remaining Little Chefs, it transferred to the holding name EG Diner in January 2018. EG Diner then closed in July 2018. The Burger King closed on 19 October 2018 and reopened in January 2019 alongside the new Greggs unit which replaced EG Diner. Another Little Chef was planned two miles east of here at Cramlington, but it was dropped after they acquired Seaton Burn. The filling station is also known locally as Fishers Lane garage and has previously been branded Total. The filling station shop was also branded Shop 'n Drive for a time. The Travelodge here was added to the site in 1998.